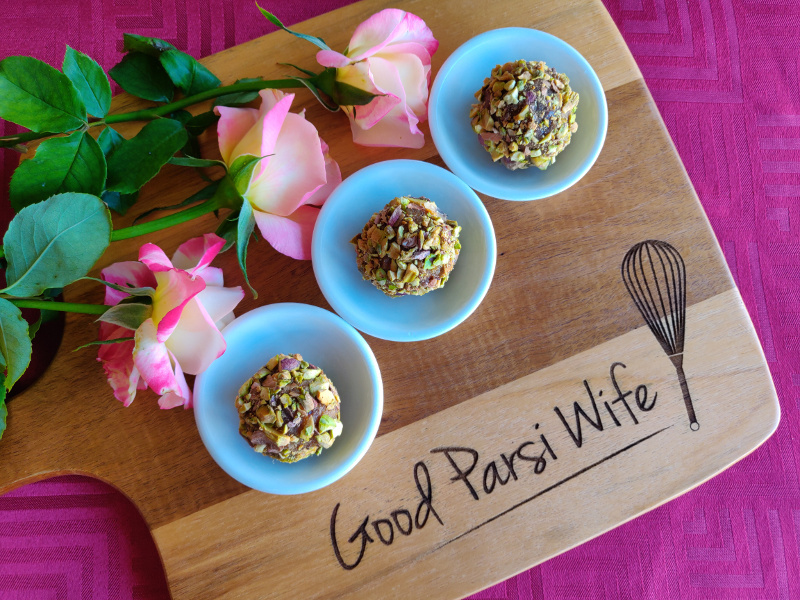 The Good Parsi Wife is a full time mother, full time foodie and part time Engineer living in Western Australia. In her spare time (does that even exist!?) you can usually find her in the kitchen experimenting for her family and social media followers, or singing and dancing around the house with her two active boys. When Bawi Bride invited the foodie community to participate in her #AtoZChallenge for 2019, I excitedly raised my e-hand to help out again (here’s what I have contributed before, my favourite Saffron Peda recipe!). There’s nothing quite like revamping classic recipes, while experimenting with new techniques and ideas. Now, it is always risky to tamper with a well-loved Parsi sweet treat. However, based on the feedback from a few willing (but honest) Parsi taste-testers, this recipe has the double thumbs up! I was presented with the challenge to whip up a ‘Mum friendly’ version of the Parsi classic Khajur ni Ghari (pastries stuffed with a delicious date mixture), and I happily accepted! The aim was to get the delicious khajur mixture taste, without spending the extra time to make pastry from scratch and all the baking/frying. 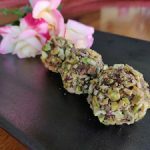 Despite my love of cooking, I often don’t have plenty of time to cook healthy snacks for the family (for those working Mummas who have little children, you’ll understand), so I took a ‘truffle’ inspired twist and have created Date Bliss Balls for this year’s #AtoZofParsiFoodChallenge. 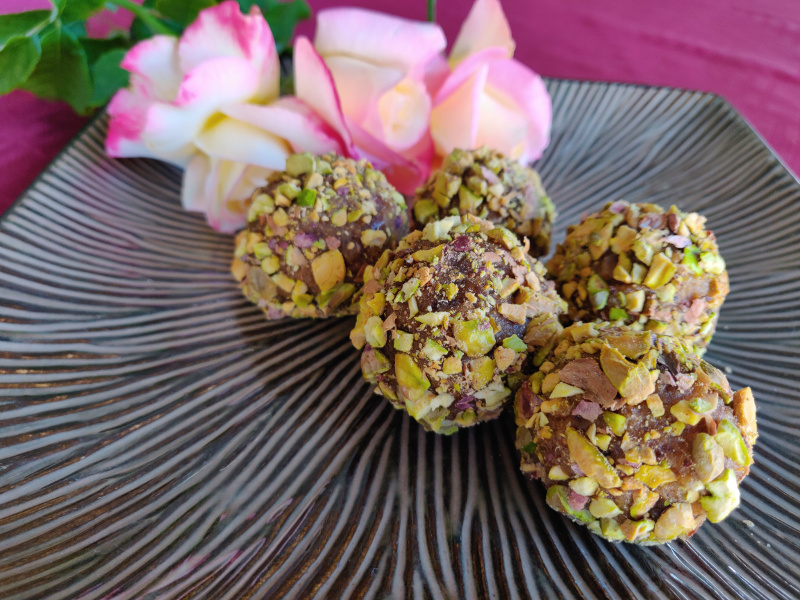 Bliss Balls are currently all the rage in Australian wholefood circles and in cafes as well as restaurants. Usually consisting of coconut/nuts/dried fruits/seeds blended up and rolled in desiccated coconut or crushed nuts, they are little balls packed food of goodness. Which means they are perfect for kids and they get bonus points for being portable and in the ‘snack-on-the-go’ category. So with this in mind, I put a new twist on the Ghari classic, replacing the pastry with a crushed pistachio coating. There is no added sugar (dates are sweet enough! ), no frying, and no nasty preservatives or flavours – just wholesome Parsi goodness! 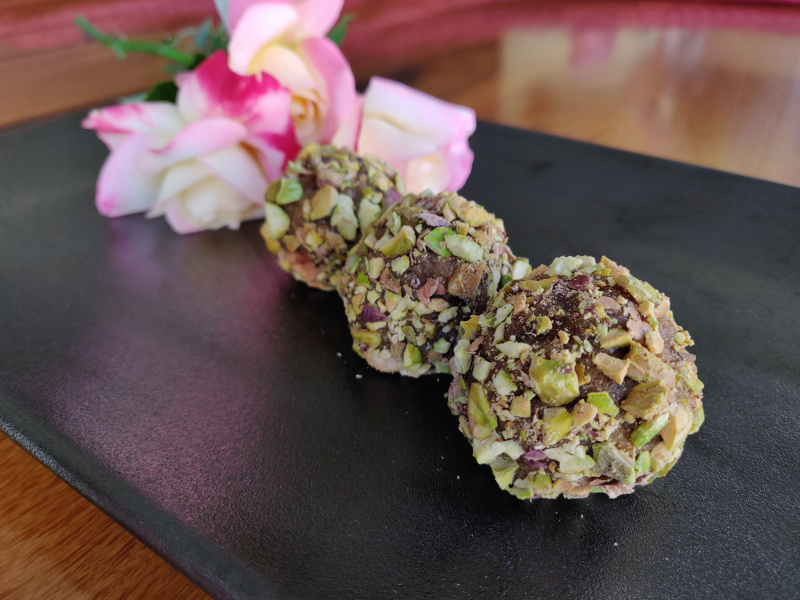 A ‘Mum friendly’ version of the Parsi classic Khajur ni Ghari - pastries stuffed with a delicious date mixture, these Date Bliss Balls are super easy to make and ultra nutritious for the kids! Blend the dates in a food processor until minced. Place in a medium sized bowl. If your processor struggles with the stickiness, you can also finely dice the dates by hand. 2. Add the almond meal, rosewater, ghee, cinnamon, cardamom, and vanilla essence to the bowl. Knead well with your hand to form a uniform mixture. Leave bowl in the fridge for 20 minutes to chill. Meanwhile, lightly crush the salted pistachios in a mortar and pestle. I liked mine chunky, but you can pound to a finer powder if desired. Place crushed pistachios in a small bowl. Take 1 tablespoon of the date mixture and roll into a smooth ball in the palms of your hands. NOTE: If the mixture is too warm/sticky and gets all over your hands, you may need to chill it in the fridge for a little while longer. Roll the smooth ball in the bowl of crushed pistachios to evenly coat. Place ball on a plate. Repeat steps 5 and 6 until mixture has been converted into 12 bite-sized Bliss Balls. 8. Place the whole plate of Bill Balls into the fridge for 20 minutes again to chill, and then store them in a sealed container in the fridge for up to 2 weeks.